All flags are available in different materials. Below is an overview of the most popular standard materials. Slightly shiny material that is used as standard for our single-sided printed flags, beach flags or feather flags. This material is excellent for full color printing because of the perfect ink absorption, which also makes it UV resistant and easily washable. This material has 80-90% of printing visible on the backside of the flag thanks to dye sublimation printing techniques. Material that will be used as standard on our double-sided printed beach flags or feather flags. This material is excellent for full color printing because of the perfect ink absorption, which also makes it UV resistant and easily washable. 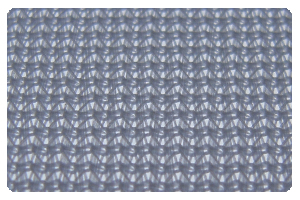 It is not possible to see through this material because of its high density. A double-sided beach flag will be made of two layers of 100D Polyester and a Polyester 'block out' -intermediate layer. Optionally available for flags. Perfect for rougher conditions or flags, Beach flags (feather flags) that are permanently outside. 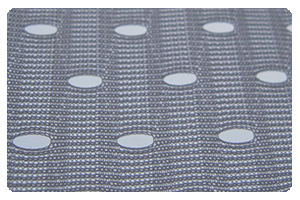 The structure of this material provides better force distribution that reduces the risk of tearing. The pattern of the holes ensures that the wind passes through the flag easily. Flags made of Air Textile have a significantly longer lifespan than standard polyester flags. This material is excellent for full color printing because of the perfect ink absorption, which also makes it UV resistant and easily washable. Air Textile is only available for single-sided beach flags. 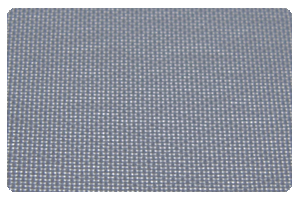 This material is also perfect for banners and other flags. The beach flag pole is made of high quality and lightweight aluminium and fiberglass. The lower parts are aluminum and the flexible top is made of fiberglass. The poles have a long lifetime because of these corrosion-resistant materials.